Neither the author, illustrator, nor publisher assume any liability for the application of the information contained in this pamphlet. It is presented solely to further the quest for a fuller understanding of the human experience. Specialized multi-cellular glands concentrated on the neck and limbs of B. alvarius produce a viscous milky-white venom that contains large amounts of the potent hallucinogen, 5-MEO-DMT. When vaporized by heat and taken into the lungs in the form of smoke, this indole-based alkaloid produces an incredibly intense psychedelic experience of incredibly short duration. There is no hangover or harmful effect. On the contrary, a pleasant psychedelic afterglow appears quite regularly after smoking the venom of B. alvarius, the Psychedelic Toad of the Sonoran Desert. The Sonoran Desert is a vast irregular-shaped area of some 120,000 square miles. It stretches from southeastern California across the southern half of Arizona and extends south into Sonora, Mexico. The desert rises from sea level to more than 5000 feet as arid lowlands of mesquite and creosote are cut by mountain canyons of oak and sycamore. It is a harsh zone where temperatures can reach 140 F. in the shade and rainfall amounts at as little as five inches per year. One of the most unique inhabitants of the Sonoran Desert is the native toad, Bufo alvarius. Although the genus Bufo includes more than two hundred species of toads, B. alvarius is the only species that exists exclusively within the Sonoran Desert. Unlike most toads, B. alvarius is semi-aquatic and must remain in the vicinity of dependable water in order to survive. Consequently, the principle habitat of this species is within the drainage of permanent rivers and streams of the Sonoran Desert. This delicate desert environment, like most places on earth, has not been overlooked by man in his constant compulsion to manipulate nature. But amazingly enough, the semi-aquatic lifestyle of B. alvarius has coincided quite well with the advance of civilized man. More than one thousand years ago, the Hohokam Indians began diverting water from the Gila River in order to irrigate the arid soil. Working with sticks and stones these primal people pioneered an extensive system of desert agriculture. Their original network of canals has been expanded for centuries and now irrigates more than 1.5 million acres of the Sonoran Desert. This is equivalent to regularly flooding an area of arid land about half the size of the state of Connecticut. The damp wet desert fields meet man's increasing needs and simultaneously provide a permanent niche in the ecosystem for B. alvarius, the semi-aquatic toad of the Sonoran Desert. B. alvarius is nocturnal and remains underground throughout the day, escaping the extreme temperatures with the strategy of subterranean life. At dusk, these desert toads leave their hidden recesses and congregate in damp wet areas near springs and streams, in fields irrigated for agriculture, or in temporary pools left after heavy rains. The breeding season, May through July, is the period of greatest activity for B. alvarius. Large healthy toads can easily be gathered after dark using a flashlight and a cloth collection bag. You won't have any trouble identifying B. alvarius. It is the largest native North American species of toad. In terms of snout-to-vent length, B. alvarius requires a minimum of three inches for sexual maturity, although breeding adults continue to grow up to seven inches in length. This desert dweller is of stout build with a squat body and a flat broad head. The skin is smooth and leathery, sparsely covered with pale orange warts, and can change considerably from a dark brown to olive or grayish green. The belly is cream colored and usually unmarked. There are one to four prominent round white warts at the corner of the mouth. But, by far, the most identifying characteristic of B. alvarius is the presence of large granular glands on the neck and limbs. The granular glands are specialized multi-cellular concentrations of tissue. The most prominent of these is the pair of large kidney-shaped parotoid glands located one on each side of the neck, over and behind the tympanum. Enlarged and elongated glands on the outside of each hind leg, between the knee and thigh, are called femorals. Similarly, the tibeals are long glands, or a line of shorter ones, that run the full length between the knee and ankle. An additional gland concentration can be found on each of the forearms. Each of these glands consists of many oval-shaped lobules about two millimeters in diameter. Each lobule is an individual unit with a duct that emerges onto the skin as a well-defined, single pore. A double cell layer surrounds each lobule and functions in the synthesis and release of a viscous milky-white venom. The venom from B. alvarius contains a very peculiar and constant spectrum of biogenic amines. Biosynthesis of the amines is accomplished via a genetically regulated enzyme system. The metabolic pathway of B. alvarius is unique within the Animal Kingdom in that it produces large amounts of 5-methoxy indole derivatives. The predominant alkaloid among these, as much as fifteen per cent of the venom by dry weight, is 5- methoxy- N,N- dimethyltryptamine (5-MEO-DMT). 5-MEO-DMT is a potent hallucinogen, psychoactive in man at doses of three to five milligrams. It was first synthesized in 1936, but its mind-expanding effects were not discovered for more than twenty years. 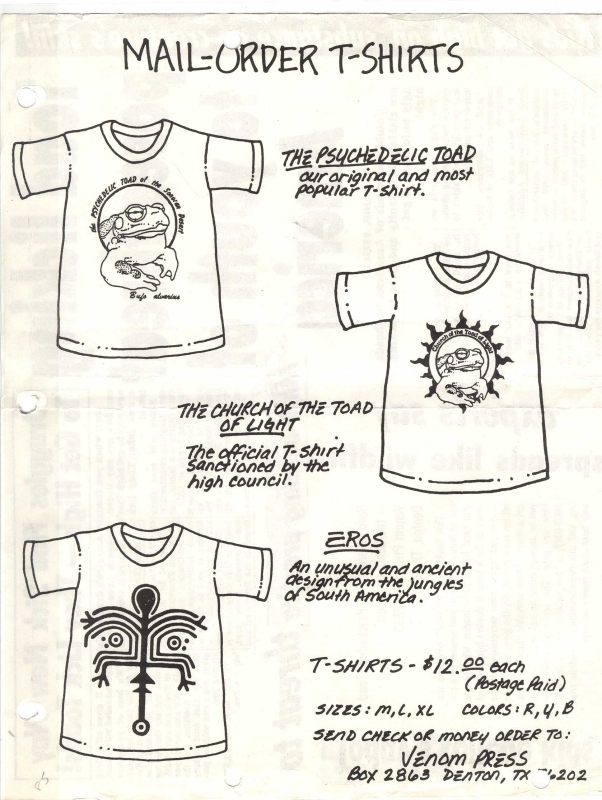 Then in 1959, 5-MEO-DMT was identified as the predominant alkaloid in the hallucinogenic snuffs of several tribes in South America. These primal people have long prepared mind-altering snuffs from flowers, seeds, bark, and stems of indigenous plants. In 1968, 5-MEO-DMT was detected in the Animal Kingdom, as well. B. alvarius became notorious as the "psychedelic toad" when its venom was shown to contain enormous amounts of this indole-based alkaloid. Whether extracted from North American toads or South American plants or synthesized in the laboratory, 5-MEO-DMT is an extremely potent hallucinogen. 5-MEO-DMT has ten times the relative potency of dimethyl tryptamine (DMT), the popular synthetic psychedelic drug of the 1960's. It should be mentioned, however, that 5-MEO-DMT differs from DMT in two major ways. First, whereas 5-MEO-DMT has a methoxy group in the 5 position on the indole ring, DMT does not. The presence of this methoxy group greatly increases the lipid solubility of the molecule. This allows 5-MEO-DMT to penetrate the blood-brain barrier and reach sites of action more rapidly than DMT. Secondly, whereas DMT is classified as a Schedule I Controlled Substance, described by Title 21 of U.S. Code as having "a high potential for abuse and no currently accepted medical use", 5-MEO-DMT is relatively unknown. Half-a-gram to a gram or more of fresh venom can be collected from a large adult specimen of B. alvarius. Half of this weight is water and evaporates upon drying. But, as must as fifteen per cent of the dry weight is the predominant alkaloid, 5-MEO-DMT. In other words, one large toad yielding one gram of fresh venom may equal as much as seventy-five milligrams of potent hallucinogen, psychoactive in man at doses of three to five milligrams. When you are ready to begin, hold the toad firmly with one hand and, with thumb and forefinger of your other hand, squeeze near the base of the gland until the venom squirts out of the pores and onto the glass plate. Use this method to systematically collect the venom from each of the toad's granular glands: those on the forearm, those on the tibia and femur of the hind leg and, of course, the parotoids on the neck. Each gland can be squeezed a second time for an additional yield of venom if you allow the toad a one hour rest period. After this, the glands are empty and require four to six weeks for regeneration. The venom is viscous and milky-white in color when first squeezed from the glands. It begins drying within minutes and acquires the color and texture of rubber cement. Scrape the venom from the glass plate, dry it thoroughly, and store it in an airtight container until you are ready to smoke it. The venom from B. alvarius is extremely hallucinogen when vaporized by heat and taken into the lungs in the form of smoke. An adequate dose for a normal adult of average size is a piece of dried venom about the size of a paper match head. Shave it into thin slices with a razor blade and put the pieces in a clean one-toke pipe fitted with a brass screen. Designate this pipe strictly for smoking toad venom, as the accumulation of residue in the bowl and condensation of vapors within the stem can yield an unintentional high with other smoking materials. Apply a suitable flame and smoke the contents of the bowl in one complete inhalation. Try to hold the smoke in your lungs as long as possible as the effectiveness will depend largely on the full dose being absorbed in one breath. Within thirty seconds, there will be an onset of almost overwhelming psychedelic effects. You will be completely absorbed in a complex chemical event characterized by an overload of thoughts and perception, brief collapse of the EGO, and loss of the space-time continuum. Relax, breathe regularly, and flow with the experience. After two to three minutes, the initial intensity fades to a pleasant LSD-like sensation in which visual illusions, hallucinations, and perceptual distortions are common. You may sense a distortion in your perceived body image or notice the world shrinking or expanding. You may notice that colors seem brighter and more beautiful than usual. And, most likely, you will experience a euphoric mood interspersed with bursts of unmotivated laughter. This ineffable episode is of extremely short duration. The hallucinogenic effects dissipate rapidly and the entire psychedelic cycle is completed within fifteen minutes. There is no hangover or harmful effect. On the contrary, a pleasant psychedelic afterglow appears quite regularly and may last several hours to several days after smoking the venom of B. alvarius, the Psychedelic Toad of the Sonoran Desert. Smoke the venom fairly early in the day on an empty but not starving stomach. Do not drink any alcohol or take any drugs or medication prior to smoking the venom. Provide a comfortable setting which is as free as possible from unforeseen distractions and intrusions. Make sure you will not be disturbed for at least thirty minutes. Be comfortably seated or prone prior to inhaling the vapors. Everything you could possibly want to know about the "psychedelic toad" is covered in this illustrated guide to B. alvarius. Beginning with the mating call and mounting clasp, the author details the metamorphosis of B. alvarius through egg and tadpole stages up to the mature adult. A special section on induced ovulation and tadpole culturing describes how the serious toad collector can, at any time, induce spawning in pet toads and insure insemination of the 8000 eggs laid by the adult female. The psychoactive alkaloids present in P. harmala have such extraordinary effects that they have earned the name "telepathines." The author presents an illustrated guide to the history, botany, chemistry, cultivation, preparation, use, and effects of this most unusual hallucinogenic plant. This unusual do-it-yourself guide details the manipulation of normal biogenic amines in the human brain. The author presents a safe and effective procedure for increasing the concentration of pineal serotonin, blocking its normal enzymatic inactivation, and shifting pineal catabolism towards the production of endogenous hallucinogens. Fully illustrated and highly recommended. The author is saying that 500mg of dried venom times 15% equals 75mg of 5-MeO-DMT per toad. However, the average yield of dried venom per toad, regardless of its size, is generally 250mg when all the glands are milked twice. Additionally, it's a good possibility that as much as 25% of the venom will contain 5-MeO-DMT which would equate to 62.5mg of 5-MeO-DMT per average toad. Please take additional note, however, that the amount of 5-MeO-DMT in any one toad varies quite considerably and could possibly be less than 25% or even 15%. Therefore, it is important to combine and mix the venom as thoroughly as possible in order to standardize the dose. This is most easily done by collecting all the venom in the same spot on a glass plate, and then chopping it all up together with a razor blade at the end of the night before the venom is almost completely dry. Once the venom has thoroughly dried, you should blend it further into a uniform consistency by crushing the venom into a fine powder using a mortar and pestle, or some similar device. Unfortunately, everyone agrees that The Handbook for the Serious Toad Collector was never published, despite having been listed in a couple of places as available. However, the information it would have contained can be found here. For those interested in the induction of breeding activity by experimental means and under laboratory conditions, outside of the normal breeding season, please see the information here. MAIL ORDER T-SHIRTS image courtesy of Thomas Lyttle. At one time, "The author welcomes all correspondence. Write: Al Box 2863 Denton, Texas 76202" This address, and Venom Press no longer exist.